I make small frames and boxes and I like to put in mirror and glass in those projects. In trying to avoid dealing with the question I usually frame in the mirror so that no one will see the clean cut but rough and sharp edges of the glass and mirror. That is not a great idea long term and there are some things where I want a floating top for where the edges will be seen. I think the general approach is sand paper but I would like to get more information from someone that has done this before. I am more concerned about glass dust and how to deal with while working. What are the tools and techniques I could employ to clean, smooth and/or polish glass and mirror edges to the point there are safe to touch? I think I can help you. To make a living, I carve glass. Tabletops, door fronts, serving platters, and almost anything else made of glass has seen my efforts. By far the best tool to use would be a Dremel type rotary tool with either a diamond burr or a stone grinding bit. These come in quite a variety of shapes, compound materials and grit levels and are specially suited for this purpose. A standard particle mask available at your local hardware store will protect your lungs when used properly. Oiling the glass with sewing machine or fresh motor oil will almost eliminate any lingering/ flying dust. Exactly which tools are needed to accomplish your task is greatly dependent on exactly what you need to do. Please visit Dremel.com for details and tutorials. Great information is also available on YouTube as well. If you do choose to purchase a rotary tool, you will find it is also very useful for a great many other things. I use either a 150 grit, cylinder shaped (similar in diameter as a #2 pencil), diamond burr, a silicon carbide grinding stone (same shape/ size) or a chainsaw sharpening stone (the blue one). Information on these bits and others can be found at Dremel.com. Be sure to wear your mask, oil your glass, and set the tool to a low speed prior to starting. Be gentle and WEAR YOUR EYE PROTECTION. I can't say enough about the eye protection thing. Been through many pairs of glasses, but still have both eyes. Undamaged! A tile cutter with a diamond blade works to smooth the edges of glass. I bought one at a garage sale to cut slate tiles and found it also works to finish glass edges. Mine has a way to tilt the blade also. I first lightly run the glass edges at a 90 degree angle against the diamond saw blade, IE, with the blade straight up and down. Next I tilt the blade over and bevel the edges very slightly. I usually end up using a fine diamond sharpening hone to go over the edges after words to be sure there are no sharp edges left anywhere. The nice thing about the tile saw, it is a wet saw so this keeps the glass dust under control. Small tile saws can be purchased very cheap, but the cheap ones do not have a way to tilt or angle the blade and I do really like that feature. It sounds like you're making many of these and just want a nice edge to your mirrored glass. You probably want minimal effort to accomplish this, for now. You have not described the need to artistically embellish the edge of the mirror / glass plates. If you'll only need to do one of the two above, then the glass table grinder is fine. However, you will need a jig if you want to grind regular angles. 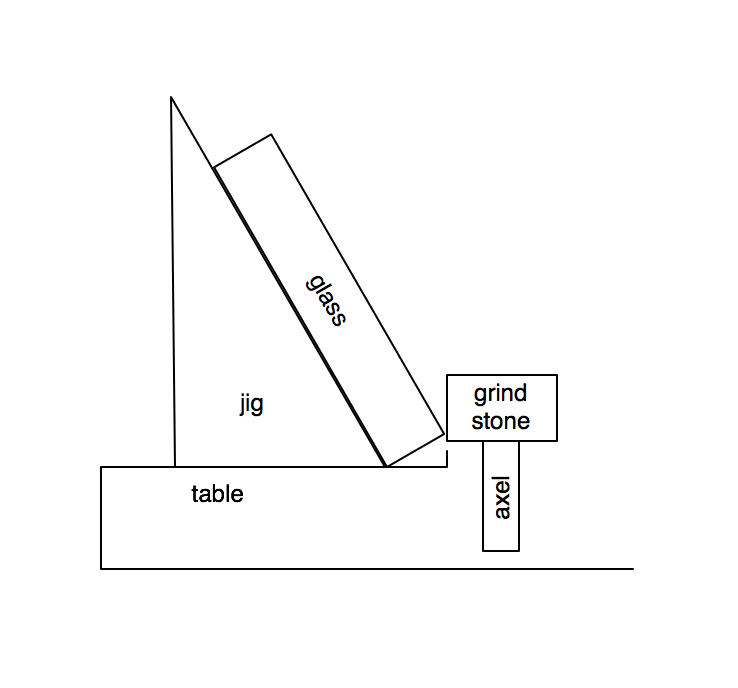 A jig is basically a sloped block that will hold the glass at the angle you want to grind the smooth angle. See below. You can create a few of them for the common angles you'll work. In case it's not obvious: the jig is generally a 'free' block and isn't mounted to the table. It can be mounted, if that's more convenient because you basically have one type of cut that you ever do. Many times, a table will have a couple holes drilled in them, for the jig to mount into via pegs. How to handle jigs is probably another question altogether. If you have a lot of glass to smooth, you could buy a glass grinder. These units are quite affordable at about $150 for a small tabletop grinder or even cheaper at some Chinese online stores. They are great for smaller pieces of glass but not for large ones. I am currently cutting bottles for crafts. I used a glass cutter and cut bottles by hand with boiling water and ice. It works if you have time. It was a waste of my time. I went to harbor freight and bought a 4 1/2" tile saw for $50 and a smooth edge 4 inch blade. It cut right through it. I've now cut about 30 bottles on the same blade in about an hour. Smoother than the glass cutter and way quicker. If you have $50 then don't waste your time. Time is money! Don't forget your eye protection and particle mask! Using your rotary tool at a slower speed, about 500rpm, gently rub the edge to be smoothed with your stone until the desired effect is achieved. This method works for any project, whatever the size.